This soccer games glossary is divided into 3 parts that includes an introduction and a learning games section for new soccer players and fans. Soccer Games Glossary is dedicated to passionate game players and fans that compete, watch this favorite of sport games and play soccer. 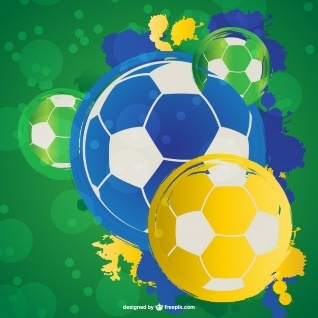 Soccer is the most popular sport in the world and is played passionately in most countries worldwide. The game is played on a rectangular field with net goals at either end. Each team consists of 11 players whose objective is to drive the soccer game ball into the other's goal by kicking, heading, or using any part of the body except the arms and hands. The goalie is the only player permitted to touch or move the ball with arms or hands. At the end of two periods of play, the team with the most goals is declared the winner. In the case of a tie, a shootout occurs depending on the rules of the league. This Soccer Games Glossary will often refer to offense or defense within the definition. An explanation of these 2 terms follows. Defenders or Defending Team: refers to the soccer player or team not in possession of the ball. Offense: team unit whose objective is to score goals. 3-on-1 break=3 attackers versus 1 defensive player. 4-2-4: playing pattern=4 defenders, 2 midfielders and 4 forwards. 4-3-3: playing pattern=4 defenders, 3 midfielders and 3 forwards. 4-4-2: playing pattern=4 defenders, 4 midfielders and 2 forwards. Added Time: time added to the end of a game, replacing minutes and seconds lost by injuries or substitutions. Advantage Rule: refers to the referee directive that states the play should not be stopped because of a foul if it would benefit the team in violation. Advantages: term for the team moving to the goal that outnumber the opposing team. American Football: term to differentiate between this game and soccer football. Assist: a feed, pass or possibly passes that lead directly to a goal. This number cannot total more than two on any single goal. Attacker: a player who has the ball and is trying to score a GOAL! Attacking Midfielder: whose duties are to support the offense by passing to forwards with the objective of scoring a goal. Attacking Team: refers to the team in possession of the ball. Back: refers to either a fullback player or active play towards the team's own goal. Balance or Shape: term for strategic player placement to provide comprehensive coverage on the field of play. Back Header: player who moves the ball backwards using his head. Backpass: the act of passing or kicking the ball to the goalie by his own team, allowing him to kick or throw the ball into play, typically creating a more favorable offensive situation. Back Tackle: defender who moves in front of the ball to gain possession from the ball carrier. Ball Carrier: is the soccer player who has the ball. Banana Kick or Hook: jargon for a kicked ball that curves and moves around obstructions. A beautiful sight to see! Beat: moving the ball past a challenger by dribbling or shooting. Behind the Defender: soccer games glossary term for section of the field between a defender and his/her goal. 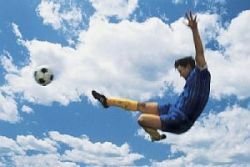 Bicycle Kick: jargon for a ball kicked backwards and over his/her head while in flight. Break or Advantage: term for rapidly moving the soccer ball towards the opponent's goal before the defenders can retreat. Breakaway: lots of action here when a player with the ball moves towards the goalkeeper without coverage resulting in a man-to-man shot. Cap: refers to the number of appearances a player has made for his country in international play. Carrying the Ball: foul worthy occurs when a goalkeeper moves more than 4 steps while holding/bouncing the soccer ball. Caution (yellow card): given by the official or referee as a sign of warning to a player who has gained ill favor by his actions on the field. Should a player receive two of these cards or warning during one match they must leave the field and no longer participate. Center or Cross: refers to a pass from the sideline with the objective of moving the ball closer to the goal. Center Circle: the area in the middle of the field where kick offs take place at the beginning of the game, after half time and after each goal that is scored. Central Defender: refers to the player who is assigned to guard the section of the field in front of his/her goal. Charging: physical contact between players, initiated by the player seeking to take possession of the ball. If done illegally, a foul is called, resulting in a free kick. Check Away: refers to movement away from a teammate in possession of the ball to bamboozle or trick a defender. Gotcha! Chop: soccer games glossary term for action to strike the ball hard in a different direction to escape a defender. Chest Trap: refers to using the chest to manage an air ball. Chip Pass: player's high pass to a teammate in an attempt to loft the ball over a challenger's head. Chip Shot: term for highflying kick over the goalkeeper's head that could score if under the crossbar. Clear: refers to moving the ball away from the goal. Clearance: an air-bound high motion with the intention of moving the ball up field. Cleats: term for tips at the bottom of soccer shoes required for traction on the field. Club: a league soccer team. Consolation Match: game to decide 3rd place between the 2 semi-final losing teams. Corner Arc: a quarter circle located in the corner of the field marking the spot where a corner kick must take place. Corner Kick: the act of kicking the ball in the corner, necessitated by the ball passing the boundary on the end of the field by a defender. Corner Flags: soccer games glossary term for flags situated at the 4 field corners. Counterattack: quick attack by the challengers shortly after they regain possession of the ball. Cover: play where a defender assists a teammate against an attacking player. Creating Space: tactic used by an attacking player without the ball to lure the opposition away from his/her teammate in possession of the ball. Cross or Crossing Pass: player who passes the ball to a mid or opposite field teammate to provide a possible goal. Crossbar: refers to the top of the goal, this bar is 24 feet in length and 8 ft above the ground. Cut Down the Angle: strategic move by the goalie to move in on the attacker. Cut Off: tactical move by a defender to position his/her body between the attacker and the goal to force a move to the sidelines. Dangerous Play: a foul called by the official when a player’s actions are deemed dangerous to the opposition. Defense or Defensemen: position of play or players assigned to curtail the challenger from scoring. Defensive Midfielder: player whose duties are to cover the best offensive player from the other team, usually stationed in front of the team's defense. Defensive Pressure: refers to aggressive tactic of defender(s) to cover the ball carrier. Deflection: refers to a hit ball that bounces off a player. Diagonal: refers to play action movement from corner to corner of the field. Direct Free Kick: a kick awarded as a result of a foul or infraction where a goal can be scored. Diving Header: jargon for a ball hit by the head of a diving player close to the ground. Draw: soccer game that finishes with a tied score. Dribbler: soccer games glossary reference for a player who uses his/her feet to move the ball. There are some smooth moves with this action. Drop Ball: action to re-start the game by dropping a ball between 2 players. Drop Kick: 2-step action by the goalie—drop ball and kick before it touches the ground. Dummy, Fake or Feint: a fake action by a player to trick a challenger into thinking he/she is about to receive the ball. Dummy Run: movement by two players of the same team; only one of which has the ball, with the intention of tricking the opposing team. Welcome to the soccer playground that includes a games glossary in 3 parts.